Main is now designated CR 523, but historically it was US 122, which ended at the intersection in the background. At the time, westbound US 22 was to the left (as today), but eastbound US 22 was actually straight ahead (which immediately curves right, and formerly was continuous with the road to the left). The US 22 bypass to the right was not built until 1942, and by then Main was no longer US 122. Behind the camera, US 122 followed what is now CR 523, then NJ 31, then US 202, and then NJ 179. Apparently in 1934, there was a plan to extend US 122 north from Whitehouse to US 9W in Haverstraw NY... although a 1934 NJ map does not show US 122 extended beyond US 22. The only hint that this extension was going to take place is a US 122 shield on an "Under Construction" part of what is now US 202 from Suffern to Ladentown NY. It is unlikely that segment was ever signposted as US 122, because later that same year, the designation was retired in favor of the new, longer US 202. 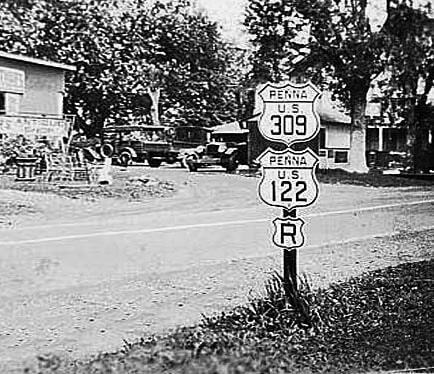 And already by the next year (1935), the US 122 designation had been recycled for use on a completely different route.